Oasis Junction Mobile Home & RV Park is located in the heart of Apache Junction Arizona, the easternmost community in the Phoenix metropolitan area. We are ideally situated off the Apache Trail (Main Street). The Superstition Freeway, U.S. Route 60, runs 2 miles south of the park. From there it is less than a half hour drive to downtown Phoenix. No car? No problem. Valley Metro Transportation has convenient stops along the Apache Trail and a short walk from the park. Don’t want to walk? Prestige Taxi and Car Service can pick you right up from your doorstep. Budget minded? Uber is also available in the area. We are close to both smaller shopping malls and major retail – Walmart is just down the street. We also have several grocery stores to choose from – Safeway, Food City, Basha’s and The Good Apple natural market are among the closest. If you have a wild side and like to ride, Superstition Harley-Davidson is up the road on the Apache Trail. Need your caffeine fix? Get a cup of Joe at our nearby Starbucks, then head on over to the Apache Junction Public Library for some relaxing reading. Feeling a bit more active? Want to get out and pump some iron? Apache Junction has Planet Fitness and LA Fitness, just to name two of the local gyms. 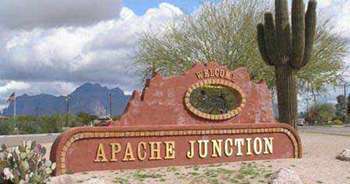 Apache Junction is home to many denominational and non-denominational places of worship. Located next to the park are AJ First Assembly of God and Desert Chapel United Methodist. We also have Our Savior’s Lutheran Church, Reformation Bible Church and The Church of Jesus Christ of Latter-day Saints near by. Some of the larger events held in Apache Junction include the Arizona Renaissance Festival, Lost Dutchman Days and the Pinal County Fair. These are annual events held in February and March when the weather is ideal for outdoor living. Apache Junction has many outdoor activities to choose from as well. Cowboy up and take a tour with Saguaro Lake Horseback Riding, or cool off while tubing the Salt River. Want a slower pace? Try the Dolly Steamboat and take a tour of Arizona’s beautiful Canyon Lake. Imagine teeing up with the world famous Superstition Mountain as your backdrop… Gold Canyon Golf Resort and Apache Creek Golf Club are two of the many local golf courses that offer convenient tee times and breathtaking vistas. If you take the time and head on down Hwy 88 on your way to Canyon Lake, you will pass Filly’s Roadhouse. It isn’t the biggest place around, nor is it the fanciest, but it sure is a place to kick back and enjoy some fun in the sun. Inside the old roadhouse, you feel like you’re back in the old west. The outdoor patio is tucked behind the restaurant and is a favorite spot to unwind and enjoy good food, drinks, dancing and an afternoon of sun. Up the road, located on the slopes of the Superstition Mountain is The Mining Camp Restaurant. It is actually two restaurants in one. The Dutchman’s Hide Out is a full menu steakhouse and bar. The other restaurant is the “Hello Arizona!” Dinner Show. Shows include a family style meal plus a one-hour performance. 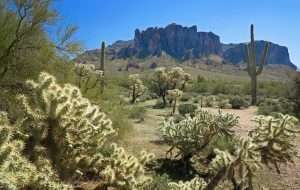 All in all, Apache junction is a wonderful place to spend some time. Whether it is for a few months or on a permanent basis, nothing can beat the fantastic quality of life it has to offer. From the daily conveniences to the many outdoor activities – Apache Junction is a just great place to call home. Call us at (480) 310-1113 and let’s make our park your home. Very nice clean and quiet park. Also found it to be friendly and all the abilities are nicely located. Very prompt to take care of repair problems. Super satisfied with my new home. Small, Clean Park with Easy access. Centers Both Town and Highways. Walking Distance to Walmart, Fast food and Local Shopping too! Yes, this is indeed a five star review. The park is small, quiet and extremely clean. The on-site manager is always working hard. I inquired about residency and the manager answered all of my questions. This place seems to be a hidden gem in Pinal County. Check it out for yourself.